An inveterate tinkerer and "broad-spectrum hobbyist," Steve just can't say no to a cool project. At 3, he was already reverse-engineering the peanut butter and jelly sandwich: "I figured out where all of the parts were, found a good tool, and built one. I've been doing it ever since." He lives in Seattle with his wife and two sons, two cats, five tarantulas, and 24 African cichlids, and thinks that one of life's great pleasures is a really sharp aged cheddar cheese. "I'm a simple man," he says. He looks at life's debris at finkbuilt.com. 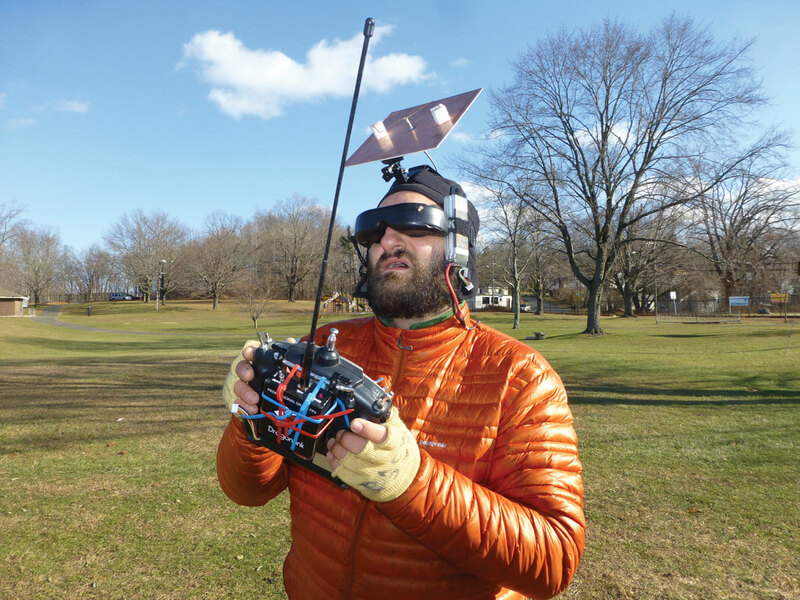 Georgi Tushev’s head-mounted FPV ground station sports a large flat high-gain “patch” antenna. Watching your rotorcraft or fixed-wing R/C plane fly is always fun, but the experience really comes to life when you get to peer directly through the “eyes” of your aircraft, as if riding along inside it. In R/C circles, this is called “First-Person View,” or more commonly, FPV. It refers to piloting a model aircraft from the perspective of the aircraft itself, via an onboard video camera, wirelessly linked to a ground station, streaming real-time video to be displayed on goggles worn by the pilot. There are several ways to set up FPV on your rig; this guide should help you understand the general requirements and get you quickly up to speed. The most popular cameras for FPV are small security-type “board cameras,” which typically come as caseless circuit boards, with lens assemblies screwed right to the PCBs. It may be tempting to use a cheap, 480-line camera, but for a really satisfying experience, it’s best to spend a bit more. $50 will get you a 600-line board camera from a trusted brand like Sony. Not only will the higher resolution greatly improve visibility, but these slightly pricier cameras have dynamic exposure features that cheaper models often lack. Most importantly, “Wide Dynamic Range” (WDR) exposure compensation will allow you to see skies and shadowed ground features at the same time, without blown-out highlights or underresolved shadows. This is more than just an aesthetic concern; these features can make a big difference in your ability to navigate. Besides “board” types, any number of small lightweight commercial video cameras could potentially be adapted for FPV drone use. As long as you can figure out power and signal connections, the only really critical requirement is low weight. As with shooting photos and video from your drone (see “Getting Started With Aerial Video“), it is especially important to keep airframe vibrations to a minimum when flying FPV. Vibrations cause blurry, nearly useless image transmissions. Balance all props, and if necessary, the bells of brushless motors. Mount cameras using foam, elastic bands, rubber standoffs, and/or other shock-absorbing means to soak up the shakes from the motors and props. Your ground-based equipment is collectively referred to as a “ground station,” and includes the video receiver, antenna, monitor or goggles, battery, and often a tripod, case, or backpack to house everything. Ground station designs vary greatly. A good one will be easy to transport, quick to set up and take down, and difficult to trip over. A variety of low-cost miniature video transmitters and receivers are marketed with FPV in mind. Common frequencies include 5.8GHz, 2.4GHz, 1.2GHz, and 900MHz. There are several factors to consider when choosing a frequency. 1) Where do you live? Different countries regulate the radio spectrum in different ways. You may want to research your area’s laws to avoid legal issues. 900MHz has great obstacle penetration, for example, but may be reserved for phones in the U.S.
2) Where do you fly? Different frequencies have different characteristics. 5.8 GHz seems to have good range per watt, but is essentially line-of-sight and will not penetrate buildings or trees. If you fly in open areas, 5.8 GHz might be a good choice. 3) What frequency do your controls use? Most R/C radios now operate at 2.4 GHz; to prevent interference, you may want to avoid that band for your video equipment. Most entry-level video transmitters radiate 100-500 mW. If you want to fly long-range flights, you may have to get a more expensive, higher power unit. Unlike airplanes, FPV multirotors tend to fly shorter-ranged missions, so you can still have lots of fun, even without a 10-mile range. omnidirectional “cloverleaf” or “egg-beater” antennas are a good choice and are easy to build and cheap to buy. Many people also choose high-gain (but also highly directional) planar “patch” antennas for ground station use, and the best-equipped systems employ “diversity” setups that consist of two or more separate receivers, using different types of antennas, to get the best of both worlds. Special switching circuitry sends you the best available signal at any given time. An On-Screen Display (OSD) is a little video processor installed in the signal path between the camera and the video transmitter. It takes information from its sensors and injects a graphical data display into the video stream. OSDs range in capability and cost, with the fancy ones featuring compass, GPS, barometers, telemetry, multiple battery voltage monitors, etc. While usually considered an “advanced” FPV system component, you can get a simple OSD for about $10 that does one very important thing: monitor and display the battery voltage. Knowing when you are about to run out of juice is pretty important for any FPV rotorcraft pilot. 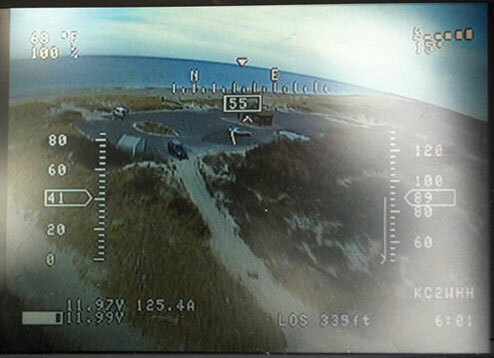 Some FPV pilots use an LCD monitor. I’ve found that piloting through video goggles makes for a much better, more immersive experience. There are video goggles made specifically for the FPV hobby, notably those by Fat Shark. Some models even have a video receiver built right into the goggles. I use a pair of MyVu Crystal goggles, which are general-use video glasses intended for watching video from an iPod, etc. I modified them by adding top and bottom shades of rigid foam, and a strap from a pair of sports goggles. As with cameras, you need to pay attention to resolution when goggle-shopping. There’s no sense using a 600-line camera with cheap 400-line goggles. As a rule of thumb, you’ll want a pair with at least 640×480 resolution. If you use an OSD, chances are you won’t be able to read the text on the display at a lower resolution.